A priest, an ex-cop, and three badass babes walk into a bar … Lucky for readers, that’s a great opportunity for the kind of rare mystery series with something for everyone—a tough guy, three awesome women, and a classic Golden Age gentleman-detective clergyman. The twist? The cop and the cleric are half-brothers who operate a PI firm out of their bar. 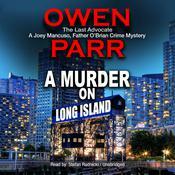 Owen Parr pulls off a crowd-pleasing coup in the first entry in his Joey Mancuso/Father Dominic O’Brian series—a perfect blending of the hard-boiled and intellectual schools of detecting. Joey’s the ex-cop, who got kicked out of the police department by means of a small frame, and the women are a fiery FBI agent (Joey’s elusive Cuban girl friend), a glamorous “researcher,” and perhaps most memorable of all, Joey’s mentor and ex-partner, Lucifer—officially Lucy, but what a nickname! Captain O’Brian’s Pub and Cigar Bar, with its old-world New York warmth and reliably friendly Irish bartender is a character in itself, the kind of place that’s like home to its devotees. So when one of the brothers’ best customers dies in an apparent suicide—a Wall Street guy celebrating a new client the night before—they’re just not feeling it. They know he wasn’t a guy who wanted to die; and they quickly find out he was someone a lot of people wanted dead. It’s a made-to-order financial puzzle for a couple of seasoned New York PI’s, with the kind of twists and scams and puzzles that warm a mystery fan’s heart like a shot of Jameson. Fans of New York detective shows from Blue Bloods to Elementary will find it right up their alley, and devotees of Golden Age mysteries will love it, especially those set in New York, like Ellery Queen and Nero Wolfe; and those starring brainy clergymen, like Father Brown, the Rabbi, and Father Dowling. Lucky for readers, that’s a great opportunity for the kind of rare mystery series with something for everyone—a tough guy, three awesome women, and a classic Golden Age gentleman-detective clergyman. The twist? The cop and the cleric are half-brothers who operate a PI firm out of their bar. Owen Parr pulls off a crowd-pleasing coup in the first entry in his Joey Mancuso/Father Dominic O’Brian series—a perfect blending of the hard-boiled and intellectual schools of detecting. Joey’s the ex-cop, who got kicked out of the police department by means of a small frame, and the women are a fiery FBI agent (Joey’s elusive Cuban girl friend), a glamorous “researcher,” and perhaps most memorable of all, Joey’s mentor and ex-partner, Lucifer—officially Lucy, but what a nickname! Captain O’Brian’s Pub and Cigar Bar, with its old-world New York warmth and reliably friendly Irish bartender is a character in itself, the kind of place that’s like home to its devotees. So when one of the brothers’ best customers dies in an apparent suicide—a Wall Street guy celebrating a new client the night before—they’re just not feeling it. They know he wasn’t a guy who wanted to die; and they quickly find out he was someone a lot of people wanted dead. It’s a made-to-order financial puzzle for a couple of seasoned New York PI’s, with the kind of twists and scams and puzzles that warm a mystery fan’s heart like a shot of Jameson. Fans of New York detective shows from Blue Bloods to Elementary will find it right up their alley, and devotees of Golden Age mysteries will love it, especially those set in New York, like Ellery Queen and Nero Wolfe; and those starring brainy clergymen, like Father Brown, the Rabbi, and Father Dowling. A trio of unlikely crime solvers come together to solve the suicide of a customer. Oddly, this customer had everything to live for and even more to die for! Joey Mancuso, ex-NYPD with unusual methods; Marcy, FBI agent and drop dead gorgeous girlfriend of Mancuso; and, Father Dominic, Mancuso’s brother and co-owner of the Captain O’Brian’s Irish Pub. Suspicious of their friends and client’s death, the three begin their investigation into the seamy underworld of Wall Street finances. Is there a correlation between losing money and death? That is what Joey, Dominic, and Marcy want to know. The book was a solidly written mystery with strong dialog and detailed descriptions. The characters were fully developed. At the end, Joey Mancuso makes the grand announcement exposing the murderer which felt reminiscent of Columbo or Ellery Queen. The story flow was smooth and flawless. A short listen but the plot was easy to follow. The narrator, Stefan Rudnicki’s performance gave life to the characters – their voices sounded much like I thought they would/should. His voice was entertaining giving voice to the gravelly sound of mystery and intrigue for Mancuso and Father Dominic was well done too. There were different dialects from Irish to Cuban to Manhattan Mob. He kept them straight, believable and not over the top. This book will appeal to fans of Owen Parr and anyone who loves dark mysteries with a grandstand at the end – announcing the killer in a room full of suspects. While this is not my favorite style of sitting through discovering who the killer is, it seemed to work. 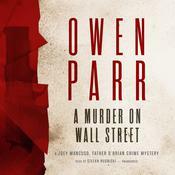 The narration for A Murder On Wall Street was done by Stefan Rudnicki who does a great job. I had no issues at all listening to him tell this story. To be honest, he allowed me to get even more into it. He voiced each character slightly differently, but the overall tone remained the same allowing for an easy listening experience. 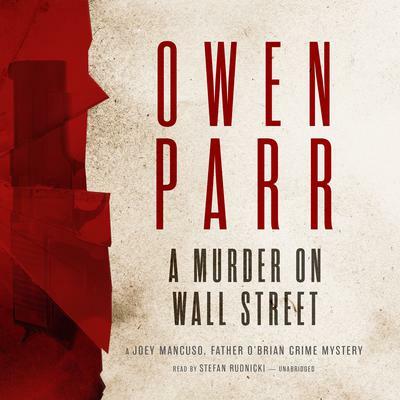 Owen Parr is a financial advisor with a major Wall Street firm, so he knows first-hand the world that can eat its own alive. Parr has published various novels, a self-improvement book, several newsletters for businesses, material for advertising campaigns, and articles for trade magazines. He enjoys fishing, golf, painting, cigars, and being with family.